Narrative: Made by prominent East Preston basket maker Edith Clayton, who used to demonstrate basket making at the museum and sell her baskets at the market. 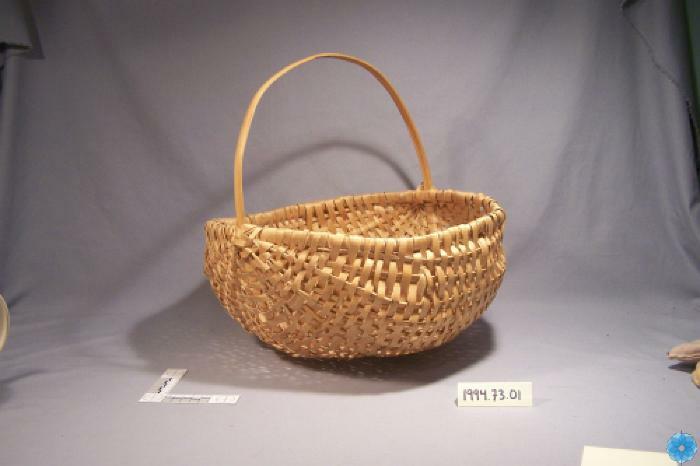 This style of basket making was brought from the American South by Blacks brought to Nova Scotia during the war of 1812 and passed down from mother to daughter. Women in the African Nova Scotian communities of the former Halifax County continue the tradition to this day. Description: Typical African Nova Scotian market basket. Made of maple and constructed of a flat-sided, circular "hoop" which forms the handle and central rib, which is fastened at right angles to another, similar hoop which forms the basket mouth. 19 additional, smaller ribs are fastened at various angles in the manner of lines of longitude over the bottom half, to form the skeleton of the basket which is then filled in with interwoven, ribbon-like strips of wood. Tilts to one side when placed on a flat surface. History of Use: Possibly made by Mrs. Clayton at the Heritage Farm.